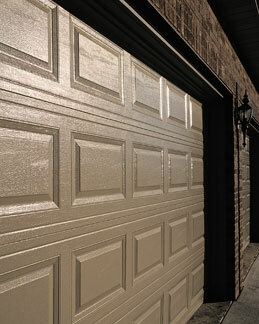 Considering a DIY garage door installation project? 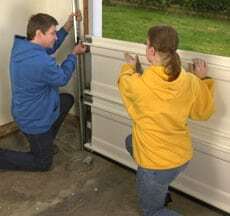 This illustrated step-by-step guide shows you how to install a garage door quickly and easily, with moderate do-it-yourself skills and tools. 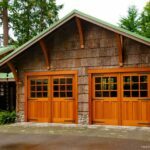 Nearly every company that sells garage doors offers full service, including delivery, removal of your old door, and installation. 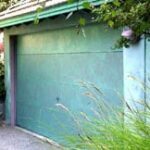 The garage door shown is equipped with a torsion spring system, which is much safer to adjust than the typical torsion-spring model. 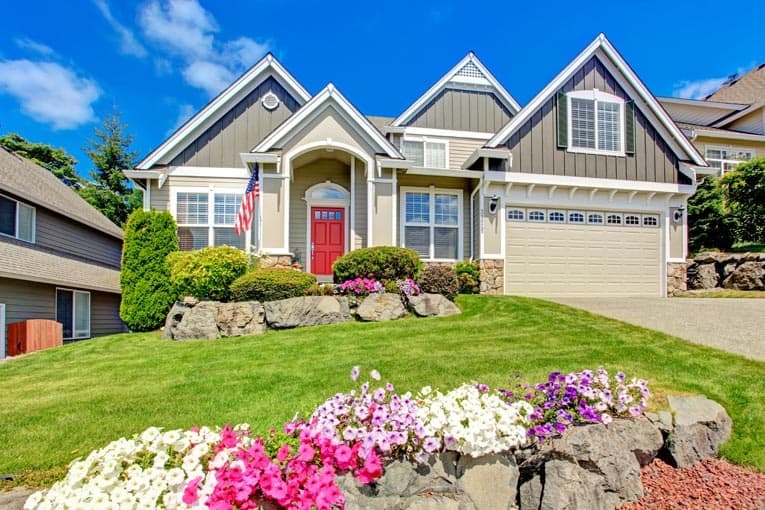 You should not attempt to adjust or remove a garage door that has a standard torsion-spring mechanism because these are under extreme tension, which makes them dangerous. Call a professional garage door installer instead. 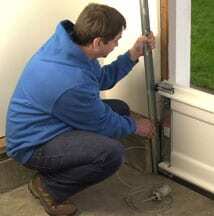 The instructions that follow will guide you through the general principles of sectional garage door installation. Be sure to follow all of the manufacturer’s instructions implicitly. 1. Tack on panel and attach hinges. 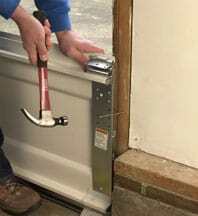 1After attaching weatherstripping to the bottom edge of the first garage door panel, set the panel in the doorway and fix it in place by driving nails partway into each jamb at an angle so that they wedge the door in place. Attach the hinges to the top edge of the door if they aren’t already attached. 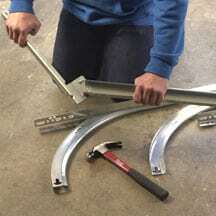 2Assemble the various pieces for the vertical, curved, and horizontal tracks, following the manufacturer’s instructions. 3. 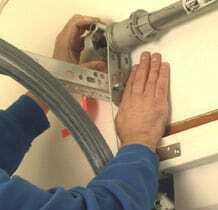 Install rollers and brackets. 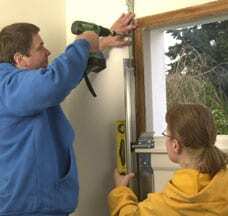 3Install the rollers and any necessary brackets on the garage door section and any wall- or jamb-mounted brackets according to the manufacturer’s directions. 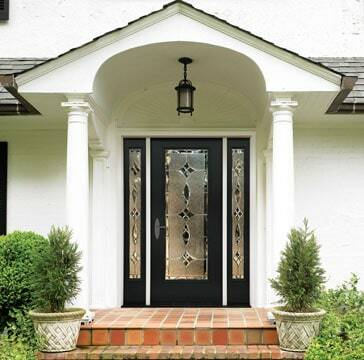 At one side of the doorway, slip the vertical track onto the rollers of the first door section. Repeat at the other side. 4Install the rollers into the second section. With a helper, lift the section, set it in place, and slip its rollers into the vertical tracks at both sides of the doorway. 5. Connect the sections together. 5Fasten the hinges of the first section to the second one. 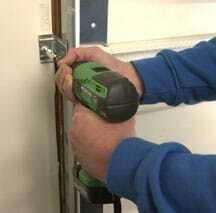 For most types of doors, a power drill with a screwdriver tip or nut driver will make this much faster and easier. 6. Fasten top plates and tracks. 6Install the third section, using the same procedures. Check the door for level and the vertical track for plumb. Fasten the top plates of both vertical tracks to the wall. Make sure the lag screws amply penetrate the framing members because the door will exert considerable force as it moves up and down. 7. Attach brackets to tracks and framing. 7Attach the jamb brackets to the tracks and fasten them to the framing members. Again, make sure the lag screws go into sound framing. Don’t tighten down the lag screws yet because you may need to adjust the tracks. 8. Install curved and horizontal tracks. 8Install the curved and horizontal tracks, positioning the curved track as shown. Bolt the pieces together. If necessary, you can rest the horizontal track on top of a ladder. 9. Mount track onto hangers. 9Check the horizontal track for level, and then cut the rear track hanger to the length necessary for supporting the track. 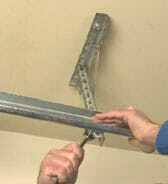 Screw the track hanger to solid framing (a ceiling joist or blocking), and loosely mount the track to the hanger. Repeat with the other horizontal track. Fit the last door section in place, and remove any temporary nails. 10. Install and adjust torque tube.